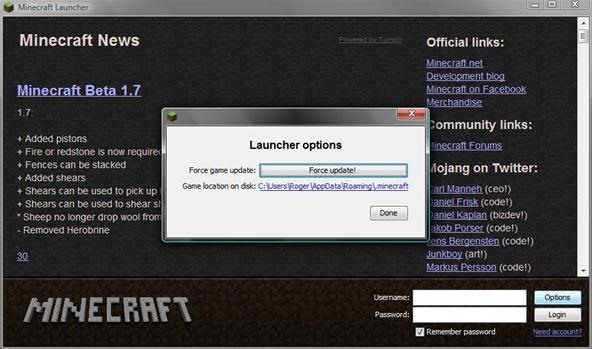 In this article, you will learn how to move your Minecraft save files. This knowledge is very useful if you want to give your friends a copy of your offline world, or play on one of theirs. You can also make backups, or move your offline world to your server folder to play online. Start up Minecraft, but don't log in. Instead, click "Options", which is right above the Login button. Now click on the link below the Force Update! button. Look for the "Saves" folder in the window that pops up, and click it. Inside will be all of your offline Minecraft worlds. To copy them onto a flash drive, or anything else for that matter, right-click the folder of the world you wish to copy, and select "Copy". Now go to your flash drive folder (or whatever else you want) and right click. Then select "Paste". The save will then be copied onto that folder, leaving the original intact. To copy a save file from a flash drive to the saves folder, do the same thing. Just copy the save file from the flash drive, to the game's saves folder. Sometimes, on school or work computers, steps A and B will not open the Minecraft folder. There are 2 methods around this. Open the Start Menu, and type in "%appdata%" without the " in the Start Search. The only result will be a folder called "Roaming". Open it. At the very top of the list should be a folder named .minecraft. Open that folder, and follow steps after A and B in Step 1. For this to work, you will need to enable "Show Hidden Files and Folders". Go to My Computer or Computer. Find the OS, (Drive C:) and click on it. Find the folder "Users" and click on that. Next, find your Username and click it. Look for a hidden folder named "appdata". Hint: Hidden folders are partially see-through. Once you're in appdata, select "Roaming", then ".minecraft"
Make backups of your worlds often, so you don't lose your progress in case of an accident.